I am re-releasing this book after 6 years. In October 2000, I released my very first book. The book is based on my feelings about many issues such as weight, domestic violence, family issues, infidelity, and so much more. The book also includes poetry. There was a time when I could stand before an audience after I ended a presentation and recite a poem I made up, off the top of my head. I included most of them in this book. People seemed to enjoy my poetry and many said that they loved hearing/reading my take on various issues. 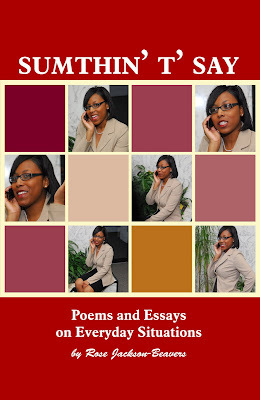 After I wrote this book I was offered a job as a columnist for a magazine and one as a newspaper columnist. Ironically after releasing the book I found that even though we immediately sold 500 copies I thought that I was finished. I had no information about being an author, selling books, or marketing. Selling 500 books in less than three months without promoting it felt good. It never occurred to me to keep going. After selling out, I finally decided to read the book again. When I read the book I was embarrassed. I counted more than 30 errors. That's after hiring two editors. Plus the interior design was horrendous. So I put the book on the shelf and forgot about it. Two years after writing the book, it ended up in many teenagers' hands. Often teens I did not know would show up on my job to discuss some of the essays. There is one about my brothers and how having a good relationship with them impacted my life. At least three 15 year old girls at different times found my job and came on site. As they requested to meet me, two were teary-eyed as they told me how my essays on brothers moved them. On several more occasions teens arrived on my job to tell me how they loved this book. Also several preachers said they used materials out of this book for their sermons. Even with all of this, I still did not know to go back and do a reprint. During the past years, so many people requested a copy and I would say, sold out. That felt good. When I decided to become a publisher, I studied the craft, study and read everything to learn as much as I could. Still, it never occurred to me to go back and improve this book and re-issue it. That was until last year. "Hi, I'm Rose the author of Backroom Confessions. It is a novel about social workers and the drama they experienced as they try to solve their clients issues." "Hello, nice meeting you. Would you sign this book?" "Sure but that's my early work, and I think you might enjoy this one better." "I want this one." Looking at me as if she had found a national treasure and I was trying to take it. "I like this book." I signed the book; she paid and walked away from the vendor engrossed in the book. It was that very moment that I decided that I would redo the book and get it back out.